Post subject: Hunting... Sounds like Terrorism! The rest of the article demonstrates how hunters justify killing and torture of animals using numerous, ridiculous and bogus excuses and otherwise exposes this "blood sport" for what it is -- terrorism and an assault on animals and nature. Yes, there is an issue about hunting being regarded as a sport, isn't there, when the notion of sport implies a generally equal contest - individual -v- individual, team -v- team. Turkey hunters tend to talk about their activities in a particularly macho way, perhaps ostensibly to compensate for the type of prey they seek to kill. As an initial thought, perhaps turkey as prey sounds hardly like a wild and potentially dangerous ‘animal opponent’ like a bear, a moose, or even a fully-grown stag does? Indeed, possibly for similar reasons, the size of the North American turkey is often carefully emphasised in hunters’ photographs of themselves and ‘their’ bird. Common iconoclastic poses tend to feature dead turkeys thrown nonchalantly over hunters’ shoulders, the birds’ lifeless heads hanging down limply with large wing feathers cascading below the conquerors’ waists. In turkey-hunter talk, male turkeys are ‘gobblers,’ ‘tom turkeys’ and ‘longbeards’, and are the more prized prey, while the smaller females are simply called ‘hens’. 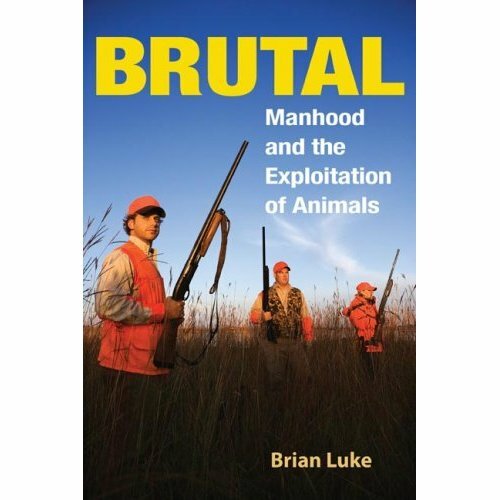 With some unacknowledged irony, turkey hunters speak of the male turkeys being rather macho, almost arrogant; strutting around, scratching at the earth, ‘parading’ around to attract mates (Trout 1999). Male turkeys ‘gobble’ at other birds; and they walk-the-walk, checking out the competition and the availability of females. Turkey hunters say they use their considerable knowledge of turkey behaviour against the birds, evolving clever hunting ‘strategies’ to ‘outwit’ the gobblers. Hunters also often like to emphasise the necessary expertise and skill required to successfully kill wild turkeys, who seem to the hunters capable of forever keeping themselves (the little teasers) just outside ‘killing distance’. Furthermore, dedication and perseverance are essential qualities for successful turkey killing, for any false move on a hunter’s part will be inevitably seen by the birds’ putative ‘supernatural vision’ (ibid). Almost instantly, three hens and a strutting gobbler appeared on the opposite side of the field, just out of shooting range. Patiently, I raised the gun while Joe [note: two against one] took over the calling and offered the strutting bird a sweet string of clucks and purrs. The hens paid little attention, but the gobbler found the calls irresistible. Slowly he approached, and when he reached the point of no return I squeezed the trigger. The gun roared and the 4-year-old gobbler toppled (ibid). The peacock call is like an extra stimulant that can force a turkey to talk when he has stopped answering the crows and other sounds that made him gobble earlier in the day (ibid). Focusing his analysis specifically on North America, Mason argues (1993: 251) that hunting keeps dominionist values ‘alive’ and ‘handy for all of society’. He notes that a hunter regards himself as the ‘leading’ and also the controlling species on the planet, encroaching on wildlife every day, deciding where and where not wildlife can live, and which to domesticate in order to eat. Finally, talking specifically about nonhuman animals rather than nature in general, the hunter is aware of the weighty responsibilities of having ‘total power over them’ (quote from a hunter in Greenwich News [Connecticut], in Mason, 1993: 250). Mason calls hunting ‘human society’s oldest man-over-beast ritual’, further noting that, although only a small percentage of Americans hunt themselves, society in general tacitly supports it, especially the hunting of deer. For example, the opening day of the deer hunt is described in An Unnatural Order as ‘a secular day of obligation’ (ibid. : 251). It appears that this North American ritual has a powerful sociological influence in terms of the maintenance of a ‘misotherous’ culture (meaning hatred and/or contempt for animals - explored below in greater detail). For Mason, misotherous culture is transmitted and maintained through peer group and secondary socialisation processes. For example, on this significant first day of hunting, ‘schools and factories close, restaurants offer ‘sportsman’s plates’, local media sponsor Big Buck contests, and a standard greeting is, ‘Get your deer yet?’’ (ibid. : 251-52). Mason further reports that the New York Times has poetically described the annual opening day deer-killing phenomenon ‘the song of the rifle’ in the ‘rite of autumn’ (ibid. : 252). Hunting is good for wild populations. When some animals are removed, new born animals have more space and food to be happy. It is OK as long as the species is not threatened. Under conditions of overpopulation and shortage of wild predators, hunting becomes vital for the very survival of herbivores. We have certain herbivorous species and even some predators, which benefit from lndscapes created by people and they even gravitate to new habitats created by people. Hunting helps to restore some balance and it provides a thrilling sport for many. Meat of game is clean, tasty and healthy to eat. Life is productive and harvesting in the wild is a part of natural sustainable way of life. Hunting is green. Urbanites, eating meats wrapped in plastic, forget where their food is coming from. Vegetarianism is not an answer. You need a digestive system of a cow, or elephant to become a herbivore. licenced hunting is a legitimate way to manage wildlife populations. how is hunting 'terrorism'? terrorism is the use of fear and or violence to force changes in policy, law, or behaviour. How does this apply to hunting? It sounds like terrorism to urbanites who are out of touch with nature. Try to grow your own fruits and veggies, especially if you need some income, and you quickly realize that some population control near your crops is needed. We lost 50% of peaches and pears in our tiny garden. Squirrels ate them right near our house. Last winter I shot (legal hunting) 12 squirrels in area about 100 yards from the house. The hunting is over, but squirrels are chattering around. Whitetails are particularly numerous near our garden; only dogs help to keep them at bay. In fact, there are more cottontails, whitetails and squirrels near our house, then in forests away from us. Hunting is done every year, but their populations do not decline. We have not enough hunters on whitetails. I would not mind reintroduction of mountain lion and wolf in our state. We would hunt those as well, but they would help to keep herbivores in balance. Some surveys of the genral population have approval ratings for hunting as high as 80%. According to one source I found, americans consumed more then 750 million pounds of wild game annually; that would be on the order of 2 million cattle. Anyone seriously believe it's only hunters chowing down so? I recall a survey, taken not that long back, concluded that about 4% of the population identified themselves as vegatarian/vegan, in the U.S. That compares very closely to the number who actively hunt. Interestin', eh? If a human killing a animal is a act of terror; is a wolf tearing the guts out of a preganant deer, while said doe is still alive, any less a act of terror? Feel up to explaining the difference, Ante? Long-term vegetarians are weird. They tend to know not what they stand for, explaining why many vegetarians are returning to meat due to the efforts of the HSUS ans other welfarists such as PeTA. It is amazing that you ask this question - again - how many times is it now. I suggest you ask Reeves. Wow, this is very revealing. Maybe there is something in this to explain certain personality traits I've been noticing here: trickery, deception, ganging up on individuals, etc.? Roger I'd like to quote some of the stuff you posted. But there are so many more sentences then 2 I wouldn't be able to do it justice without breaking forum rules like you just did. I know the proper thing to do would be to report this to Josh so he can tell you to edit your post to conform to the rules. But it seems so much easier to just let you know and save Josh all that time. Now on to turkey hunting. This is a good time of the year for that since turkey season opens in a few weeks. Let's talk about this so called macho thing of just going after the toms and not the hens. Non hunters should ask questions of hunters before they write this stuff, then they wouldn't look so bad. See us hunter prefer to not shoot hens this time of year, because they are sitting on nests. One tom will breed with many hens, so one less tom won't matter much. But to kill a hen that is sitting on a nest is unacceptable. And for the record, hens are legal to kill during the fall hunts, so it's not really a macho thing as a practical thing. When it comes to hunting turkeys, they are actually harder to hunt then deer. If turkeys had the sense of smell deer have, you wouldn't get close to them. But turkeys rely on their eyesight. A turkey's vision compared to ours is like looking through 10 power binoculars. Which means even the slightest movement is seen and the turkey goes the other way. Oh and just for Ante since I'm sure he posted this thread just for little old me. Dumpster diving sounds like eating out of a landfill. I'm sorry if I have broken the rules - but I do not think I have. I cleared this sort of thing with animallover. I cited my own writing, so I think that means the 2 sentences rules does not apply. "The politically Incorrect Guide to Hunting" by Frank Miniter. 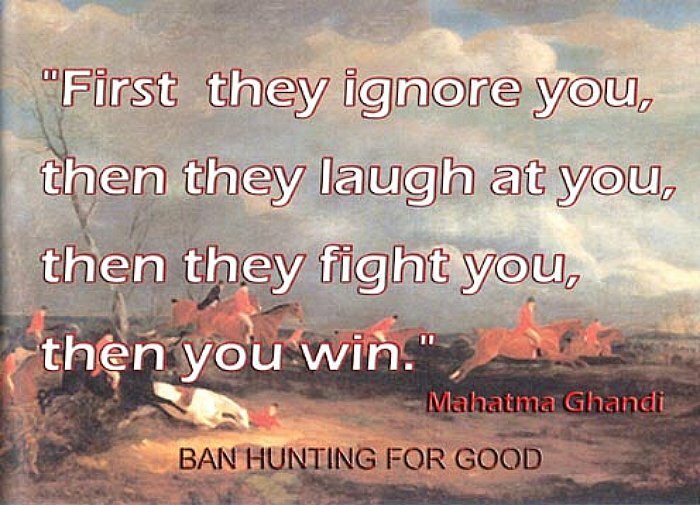 Does a pretty fair job of investigating how hunting impacts the enviroment and people. There's amusing reporting on the activities of something called 'Wounded bear rescue' during the Dec 2005 bear hunt. Even more telling was how the media behaved during same. Eye-opening reading, for those not afraid of the whole truth. Ante: still not up to answering my question? Why is hunting by humans considered terrorism, but a wolf eatting a deer alive not? I believe that was Dr. Roger Yates own essay. Do you have a proof otherwise? I hope you are capable to understand that quoting one's own writing is no a copyrights violation or are you just continuing with your deception, provocation and hot air? The title of your thread....Sounds like Idiocy! terrorism: n. The unlawful use or threatened use of force or violence by a person or an organized group against people or property with the intention of intimidating or coercing societies or governments, often for ideological or political reasons. Let's see. How does hunting fit these definitions of terrorism? It isn't unlawful. It isn't done against persons or property for the purpose of coercing government or society. It isn't politically motivated. Doesn't seem to fit very well does it? A word of advice Ante: If you intend to use a certain word, learn it's proper meaning before using it! Failure to do so can really make you look like a jackass. Good explanation to clear the air about turkeys and turkey hunting, there Hunter. I am soooo looking forward to turkey season starting. I salivate at the just the thought of smelling that bad boy in my smoker. I've done lot's of different kinds of hunting since I was a kid, and I think, by far, turkey hunting takes the most hunting skill of any kind of hunting in America. I'm a die-hard elk hunter, and elk hunting is harder in terms of the amount of work involved: a LOT of hiking in difficult mountain terrain, packing out a large carcass, dealing with the ever-changing autumn weather in the mountains, etc.. But turkey hunting is harder in terms of the pure skill challenge it presents to us. The shot is often more difficult than in big game hunting, and the calling is more difficult than the calling in duck hunting. And of course, there's that pesky super bionic eyesight of theirs!